That portrayal is of course inaccurate: the fuel tanks at the Gaza power plant (not the structure itself) were hit by errant tank shells (not by “an airstrike”) whilst the IDF tried to prevent an imminent attack by terrorists carrying anti-tank missiles. Additionally, the conflict was not “between Israel and Gaza” but between Israel and terrorist organisations based in the Gaza Strip and Coomarasamy’s bizarre and unsourced ‘they’re each as bad as the other’ claim that “Israel and Hamas continue to argue” actively hinders audience understanding of the facts behind the conflict. Coomarasamy makes no effort to relieve listeners of the misleading impressions created by Gilbert’s inaccurate claim of a ‘siege’ on the Gaza Strip or to inform them that the descriptions they hear of a shortage of medical supplies actually have nothing to do with Israel. Unfortunately, rather than clarifying to audiences that the Gaza Strip has not been under occupation for a decade and instead of pursuing the subject of what Gilbert really means when he talks of a “right to resist” (in a recent interview with the Guardian, Gilbert stated that “[t]he right to resist implies also the right to resist with arms, if you’re occupied”), Coomarasamy gets into a futile academic discussion with Gilbert about medicine and politics before providing him with the opportunity to whitewash Hamas abuses. Coomarasamy ends the interview there and, as has so often been the case in the past, BBC audiences have once again been fed Gilbert’s unhindered falsehoods and propaganda – as well as promotion of his book. 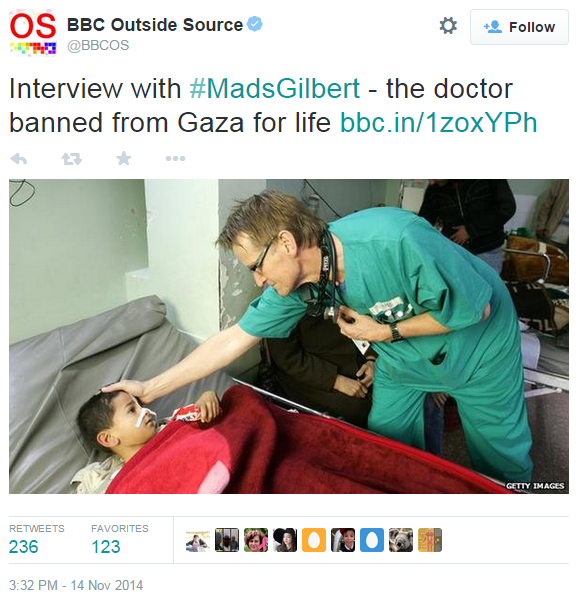 Mads Gilbert is not a “pro-Palestinian” activist as claimed by Coomarasamy in his ostensible impartiality box-tick. Those who are truly pro-Palestinian (and perhaps especially those supposedly bound by a professional oath) would not whitewash Hamas’ torture of its political opponents, its exploitation of patients as human shields or its diversion of resources which could improve the lives of ordinary Palestinians for the purposes of terrorism. 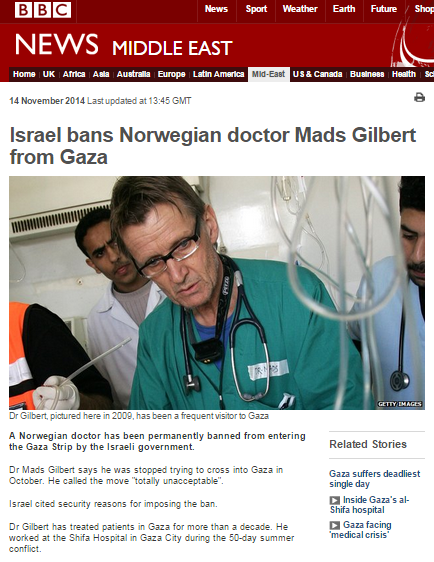 Sadly, the BBC continues to avoid telling Mads Gilbert as he really is. On November 14th the Twitter account linked to the BBC World Service radio programme ‘Outside Source’ promoted a segment from that day’s broadcast as a stand-alone item. Of course Mads Gilbert has not only been frequently featured on the BBC World Service, but on a variety of other BBC platforms too and, as has so frequently been the case in the past, in this item no attempt whatsoever was made to correct the misleading impressions received by BBC audiences as a result of Gilbert’s promotion of unchallenged propaganda. In fact the main causes of death in the Gaza Strip are cardiovascular disease, cancer and cerebrovascular disease. There is, of course, no “siege” on the Gaza Strip, but nevertheless the BBC still continues to energetically promote that particular falsehood. As we had cause to note here on numerous occasions during this summer’s conflict, the issue of shortages of medical supplies in the Gaza Strip has nothing to do with the restriction on the entry of dual-use goods imposed by Israel as part of counter-terrorism measures and in fact arises from long-standing disputes between the Palestinian Authority and Hamas. Clearly too, Gilbert’s hysterical claim of a limit or ban on foreign medical staff travelling to Gaza is a gross distortion. So yet again we see the BBC providing an unhindered platform for Mads Gilbert to promote his usual deliberate misinformation. Notably, the BBC made no effort to inform audiences of the controversy surrounding that letter when two of Gilbert’s co-signatories were found to have a history of disseminating antisemitic material or of the Lancet editor’s subsequent comments on the issue. The BBC knows full well that there is no “siege” on the Gaza Strip and it should by now also be aware of the fact that Israel does not pose any limitations on the entry of medical supplies. However, it continues to mislead BBC audiences worldwide by providing an unhindered platform for Mads Gilbert’s promotion these falsehoods, thus clearly breaching its own supposed editorial standards of accuracy and impartiality. On August 18th the BBC’s ‘Hardtalk’ aired an interview with Mads Gilbert. 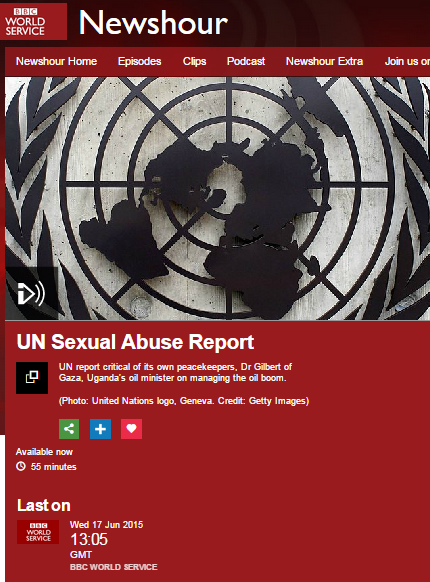 The programme is promoted on multiple platforms: on BBC iPlayer for those in the UK or as a podcast or, for a limited period of time, on BBC World Service radio. 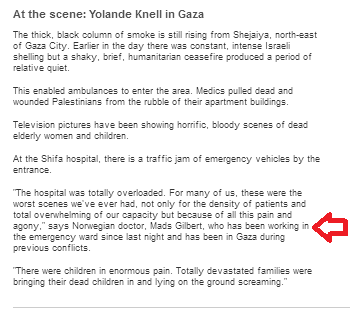 This is not the first time that the BBC has provided amplification for claims made by Gilbert himself or other members of the medical profession working at Shifa hospital since the commencement of Operation Protective Edge – as was documented here. It is obviously difficult to comprehend the rationale behind ‘Hardtalk’ producers’ thinking in terms of their evaluation of any contribution to audiences’ factual knowledge and understanding of the conflict in Israel and the Gaza Strip which could possibly be made by the blatant propaganda of a long-time political activist such as Mads Gilbert. But in addition to the fact that nevertheless the BBC elected to allow amplification of Gilbert’s plethora of inaccurate and misleading claims, it is no less interesting to note the points at which his extremist narrative dovetails with that of the BBC representative conducting the interview, Zeinab Badawi. Preliminary examination (as yet uncompleted) of the casualties in fact shows that 46% were terrorist operatives. She allows Gilbert to mislead audiences with a dishonest portrayal of the reasons for the shortage of medical supplies in the Gaza Strip. 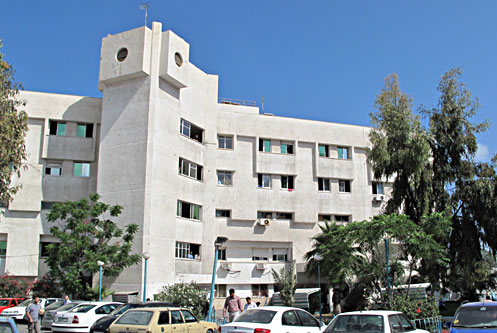 Badawi also permits Gilbert to lie unhindered about the topic of non-payment of salaries to Hamas employees which is in fact the result of a dispute between Hamas and the Palestinian unity government. She makes absolutely no effort to counter Gilbert’s distorted description of the situation in Gaza as exclusively attributable to Israel by informing them that Hamas was given every opportunity to avoid the conflict but chose not to do so. 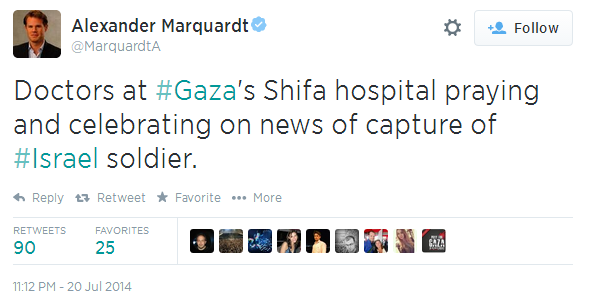 On two separate occasions Badawi allows Gilbert to wriggle out of the issue of Hamas’ use of Shifa hospital – despite journalists (including Yolande Knell) having documented the presence of Hamas leaders in that civilian facility. Badawi makes no attempt to correct the inaccurate and misleading impression given by Gilbert to audiences on the issue of proportionality in warfare. She likewise fails to correct his false claim that Israel broke the 2008 six-month lull. In fact it was Hamas which breached the agreement by both continuing to fire rockets and mortars throughout and with the construction of a cross-border tunnel aimed at kidnapping Israeli soldiers. Not only does Badawi not challenge Gilbert’s inaccurate and misleading description of border restrictions implemented to curb the smuggling of weapons into the Gaza Strip as a “siege”, but – like many of her colleagues before her – she adopts that Hamas terminology herself. She also fails to adequately correct Gilbert’s inaccurate version of events, which of course entirely erases Hamas terrorism from the picture presented to audiences, as well as the violent Hamas coup of 2007. At no point does Badawi clarify to audiences that Israeli control of Gaza’s coastal waters and airspace was agreed to by the representatives of the Palestinian people in 1995 when they signed the Interim Agreement and that no amendments were made to that status quo in the agreement signed by the PA and Israel after the 2005 withdrawal. Neither does she point out that – despite Gilbert’s inaccurate claim that the Gaza Strip is still occupied – the facts show otherwise. Badawi’s vigorous promotion of statements made by Mahmoud Abbas in relation to missile fire from the Gaza Strip is not accompanied by the very relevant information that Fatah’s Al Aqsa Martyrs Brigades have actively engaged in missile fire throughout the recent conflict. Even Gilbert’s most off the wall comments go unchallenged and uncorrected by Badawi. Whilst viewers and listeners may have gained some insight into the mindset of Mads Gilbert from this interview, they gleaned no factual information which would help them better understand the conflict and indeed were actively misled by Gilbert’s propaganda thanks to Zeinab Badawi’s failure for the most part to challenge his blatant inaccuracies. What this interview does provide, however, is yet another example of the BBC’s adoption of Hamas terminology in its willfully inaccurate misrepresentation of border restrictions aimed at combatting terrorism against Israeli civilians as a “siege”.